How To Make Awesome Flaky Paleo Scones! 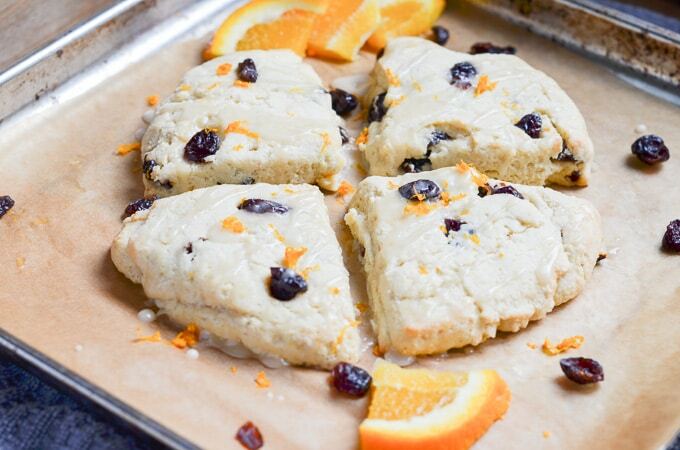 Home » Breakfast » How To Make Awesome Flaky Paleo Scones! These Paleo Scones (Paleo, gluten-free, dairy-free, grain-free) with almond flour taste so authentic, they disappear as soon as I make them. 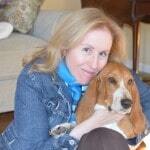 When starting a gluten-free diet, it did not enter my most vivid imagination that I would ever eat a scone again. I use a base recipe and then change the ingredients for the specific recipe I am making; in this case, cranberry and orange. Gather the ingredients. Preheat oven to 350 degrees F.
Tip: try to have all ingredients room temperature. 3. 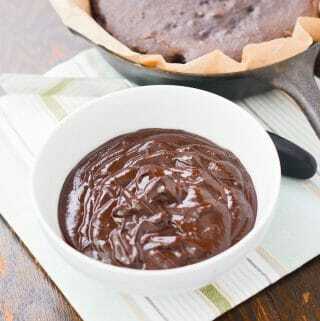 In a medium-sized mixing bowl, add all the ingredients and mix well to combine. 4. Place the dough ball on a parchment lined baking pan. Tip: if the dough is too sticky, add a bit more almond flour. 5. Mold and flatten to dough into a round shape. 6. Cut the round shape into four pieces. 7. 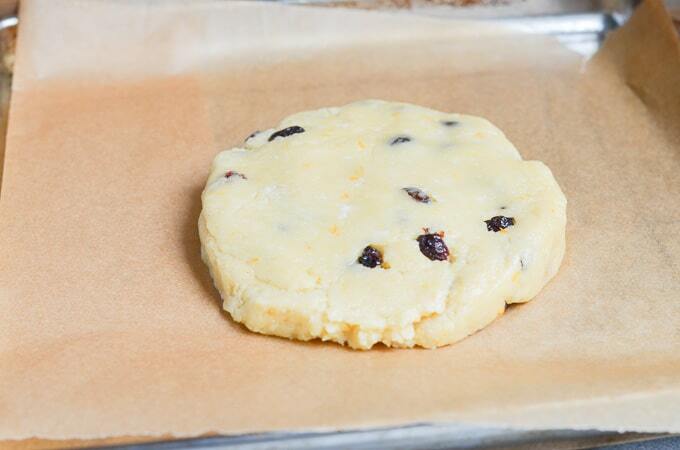 Separate scones with at least an inch between them while baking. 8. Bake for approximately 25 minutes until slightly browned tops. 9. Add glaze and eat warm or let cool. 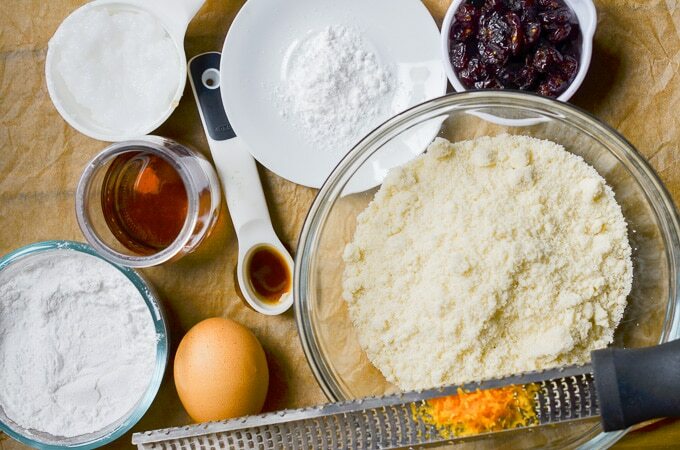 In a small mixing bowl, add 1/4 cup organic confectioners sugar and 1/2-1 teaspoon fresh orange juice. 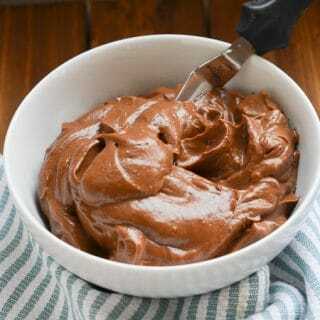 Whisk these ingredients until the icing is smooth and pourable. You may need to add a bit of sugar or orange juice to get the desired consistency. An alternative to orange juice is unsweetened almond milk or another non-dairy milk. Tip: For maple glaze, use almond milk instead of orange juice and add 1 teaspoon of maple syrup. 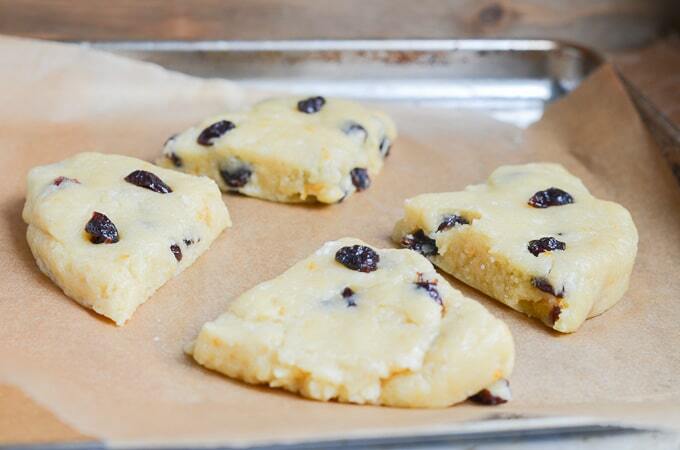 For Chocolate Chip Paleo Scones – replace the cranberries and orange with dairy-free chocolate chips. 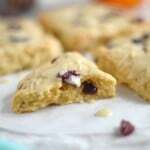 Try Savory Paleo Scones by making the basic scone recipe (without additional flavors). Add fresh herbs, or perhaps chopped bacon. Or make a breakfast sandwich. I like to enjoy plain paleo scones with jam! Pumpkin Paleo Scones – working on this recipe! Paleo Raspberry Orange Scones – replace the cranberries with dried raspberries. Paleo Blueberry Scones with Maple Glaze – Base recipe without flavorings (cranberries and orange), then add blueberries (fresh works best). See above recipe for maple glaze. 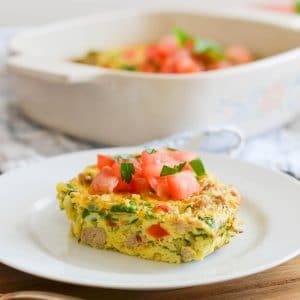 Looking for other amazing Paleo recipes? Check these out! 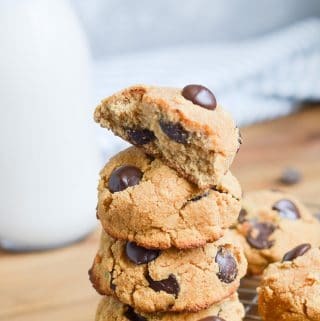 These delicious Paleo Scones (grain, gluten and dairy free) taste so amazing! Try with a bit of your favorite jam, jelly or ghee. They are delicious with a bit of glaze as well. 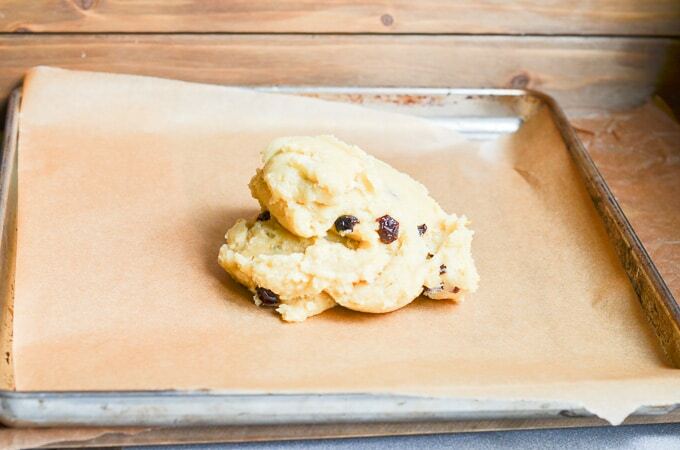 Prepare a baking pan by lining with parchment paper. 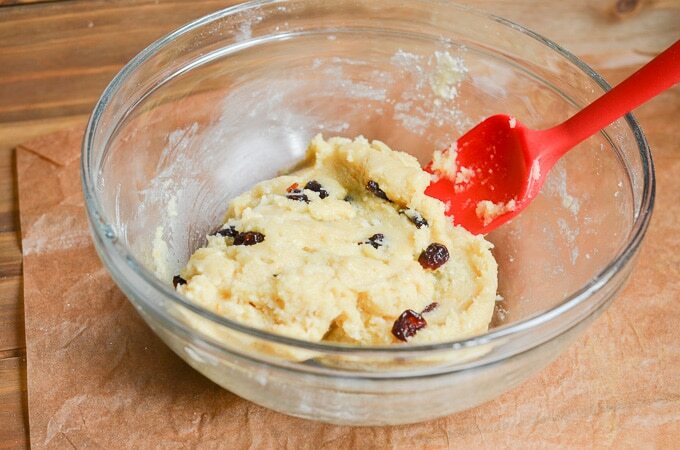 In a medium-sized mixing bowl, place the dry ingredients and whisk until all (or most) lumps are gone. Almond flour tends to have lumps. Then add the rest of the ingredients and mix well (I use a large spatula). Place mixture onto the prepared baking sheet with parchment and shape into a circular round about 1 inch in thickness. Cut into four - six pieces. Separate pieces so they are not touching and can bake this way. Bake for 20 minutes or until slightly browned on top. Let cool and serve. Can be stored in airtight container. Optional: top with glaze once cooled. 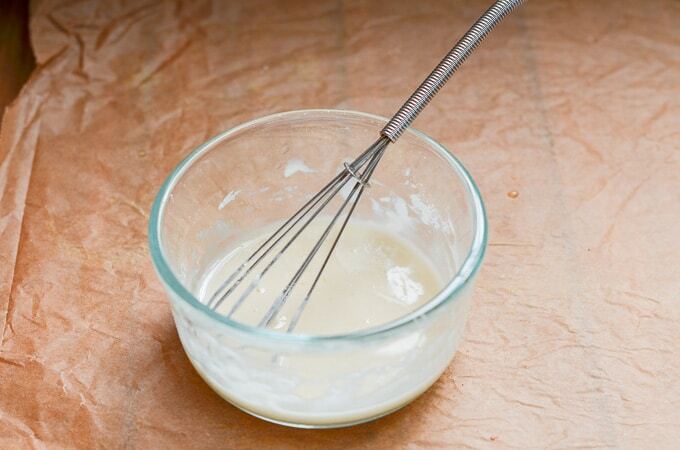 To make glaze, place confectioners sugar and orange juice in a bowl and whisk until it forms a smooth glaze. 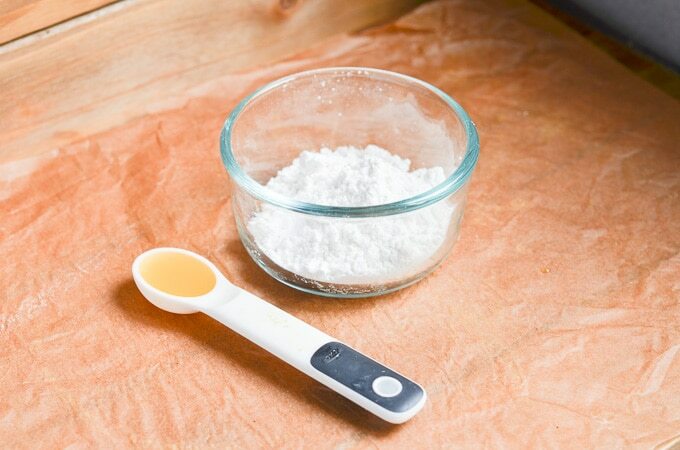 You may need to add a little more sugar or orange juice to get the right consistency. 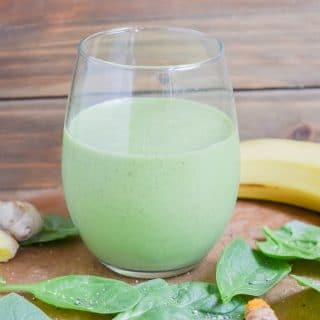 An alternative to orange juice is almond milk or another non-dairy milk. 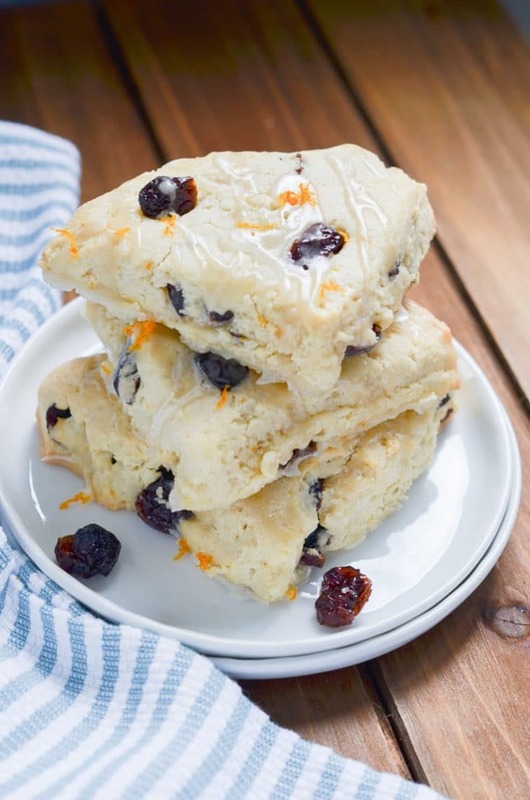 For Chocolate Chip Paleo Scones - replace the cranberries and orange with dairy-free chocolate chips. 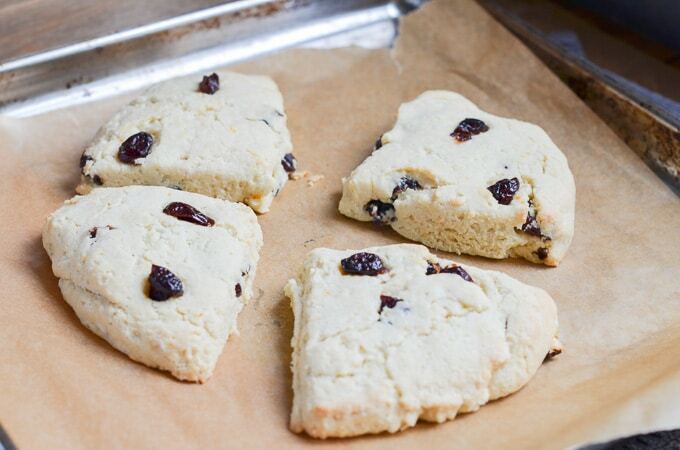 Try Savory Paleo Scones by making the basic scone recipe (without additional flavors). Perhaps, add fresh herbs, chopped bacon. Or make a breakfast sandwich. I like to enjoy plain paleo scones with jam! Update Notes: This post was originally published on September 18, 2015, but was republished with an updated recipe, new photos, step by step instructions and photos, baking tips and a video in November 2018. 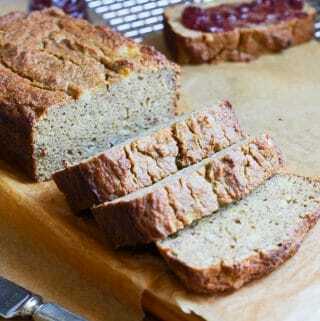 Recipe adapted from Paleo Blueberry Scones. Previous Post: « How To Make Paleo Pumpkin Ice Cream! Made these substituting Lemon and fresh Blueberries for the orange and cranberries. Doubled recipe but divided into two and cut each into 6 pieces. Make sure to use large enough pan to separate at least 1/2 inch. No glaze needed IMHO. Hi KJ! 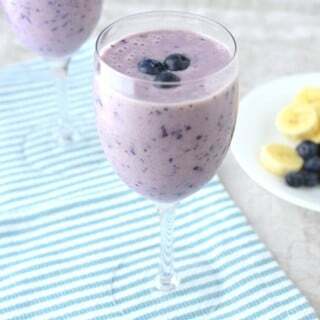 Sounds great with blueberries and lemon. Glad you liked the recipe! I know this is an older recipe but I’m wondering, when recipes call for coconut oil, are you supposed to measure in liquid or solid form. I love these scones because they are as tender and orang-y as promised. However, to give them a different scone shape, I dropped the scones on the parchment covered cooke sheet and then refrigerated them for about 20 minutes so that they would hold their shape. I also reduced the temperature to 325° and cooked them for about 14 minutes; I think my oven runs hot! 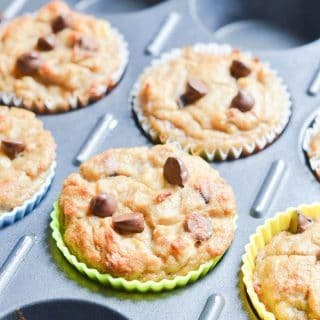 Can the almond flour be substituted for coconut flour to make it AIP? These look delicious! I never would have guessed that you could make such tempting grain-free scones–pinning this for my gluten-free friends!